Our second wedding cake of Saturday 13th May was to The Lawn, Rochford, Essex for the lovely Mariam and Peter’s wedding celebration. 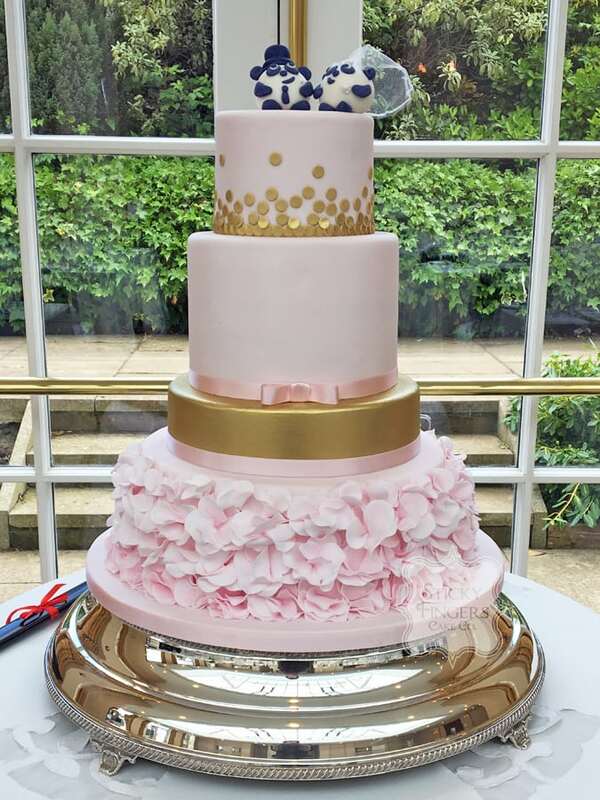 I had such a lovely time when I met the happy couple and their families at Mariam’s family home to chat about cake and it was an absolute pleasure to produce their 4 tier blush pink and gold wedding cake. The cake had a petal ruffle bottom tier, then a gold lustre “dummy” tier, a deeper blush pink tier and a top tier decorated with gold dots. I also made a cute Panda “Bride and Groom” cake topper to sit on top of the cake. They had a lot of guests so I also made a cutting cake for the kitchen. All the tiers were Cookies and Cream – they fell in love with the flavour at consultation and decided just to go with the gorgeousness that is Cookies and Cream! Who doesn’t love an Oreo biscuit, right?! Massive congratulations to you both, wishing you a long and happy life together!